Probability functions figure prominently in optimization problems of engineering. They may be nonsmooth even if all input data are smooth. This fact motivates the consideration of subdifferentials for such typically just continuous functions. 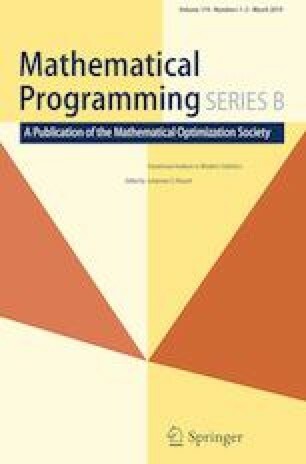 The aim of this paper is to provide subdifferential formulae of such functions in the case of Gaussian distributions for possibly infinite-dimensional decision variables and nonsmooth (locally Lipschitzian) input data. These formulae are based on the spheric-radial decomposition of Gaussian random vectors on the one hand and on a cone of directions of moderate growth on the other. By successively adding additional hypotheses, conditions are satisfied under which the probability function is locally Lipschitzian or even differentiable. This paper is dedicated to Professor Roger J-B Wets for his 80th birthday. This work is partially supported by CONICYT grants: Fondecyt 1151003, Fondecyt 1150909, Basal PFB-03 and Basal FB0003, CONICYT-PCHA/doctorado Nacional/2014-21140621. The second author thanks the Deutsche Forschungsgemeinschaft for their support within project B04 in the Sonderforschungsbereich / Transregio 154 Mathematical Modelling, Simulation and Optimization using the Example of Gas Networks.